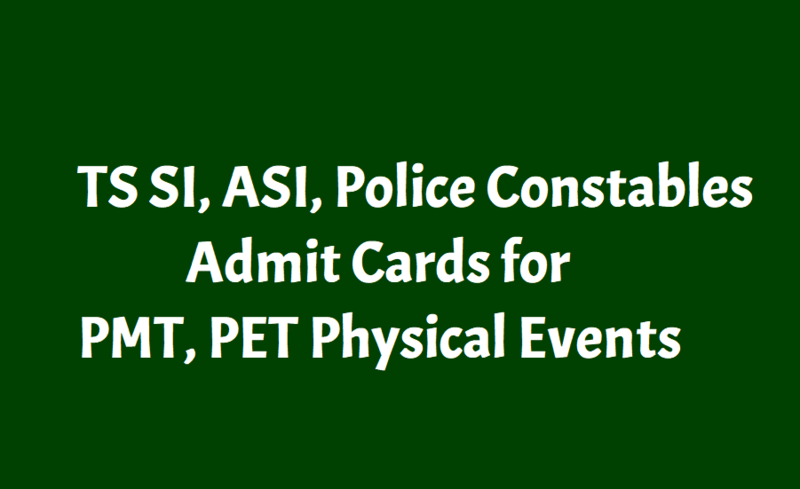 TS SI, ASI, PC Police Constables Admit Cards for PMT, PET Physical Events: TSLPRB had completed the procedure of filling the Part-II (Final) Online Application to participate in Physical Measurement Test and Physical Efficiency Test (PMT / PET). Candidates can download Admit Card / Intimation Letter of PMT / PET and aslo Candidates will get a chance to correct errors, if any, committed while filling Part-II Online Application Form. No need to approach TSLPRB in this regard. The Telangana State Level Police Recruitment Board (TSLPRB) will release revised admit cards for the physical measurement test/ physical efficiency test for the Sub Inspector (SI) and Constable posts. The test will be held from February 11. "Candidates have to necessarily download their Revised Admit Cards / Intimation Letters to be able to continue to participate in the Recruitment Process," reads the official notification. The Board has cancelled two venues for the test-- Goshamahal, Hyderabad and KU Grounds, Warangal. Candidates can download the admit card from February 5. The tests will be held within a period of 35-40 working days, which is by the third week of March. "PMT / PET will be conducted at 3 Venues / Grounds in Hyderabad (for Hyderabad and erstwhile RR District Candidates) and at 1 Venue / Ground in each of the Headquarters of the other erstwhile Districts of Warangal, Karimnagar, Khammam, Mahbubnagar, Nalgonda, Sangareddy, Adilabad and Nizamabad," reads the job notice. Candidates can download the admit card till February 9 by logging into their respective user accounts on the official website and by entering their credentials. The Telangana State Level Police Recruitment Board (TSLPRB) has released revised Admit Card / Intimation Letter of Physical Measurement Test (PMT) & Physical Efficiency Test (PET) from February 5, 2019. The candidates, who have applied online for the TSLPRB SI posts, can download their admit card for PMT/PET from today to 12 midnight on February 9, 2019. The website and above-mentioned link response are very slow as too many users are on the website. The candidates are advised to keep patience and re-visit the website after few minutes if the link shows any error. 1) Log on to the official website: www.tslprb.in. 7) Carry your admit card at the examination hall as per the information given on the admit card. Physical Measurement Test / Physical Efficiency Test from 11th February 2019 PMT / PET will be conducted at 3 Venues / Grounds in Hyderabad (for Hyderabad and erstwhile RR District Candidates) and at 1 Venue / Ground in each of the Headquarters of the other erstwhile Districts of Warangal, Karimnagar, Khammam, Mahbubnagar, Nalgonda, Sangareddy, Adilabad and Nizamabad and this process is likely to be completed within a period 35-40 working days, by the third week of March 2019. Step 1: Go to the official website tslprb.in. Step 2: On the home page under TS Police Recruitment 2018, the link for PMT, PET Admit Cards would be activated. Step 4: On the new window, enter your registration number and date of birth to access your account. Step 5: The PMT/PET Admit Card would be available for download in your account. Step 6: Click on it to download and print it. After downloading the Revised Admit Card / Intimation Letter, Candidates shall take a printout of the same, preferably on A4 size paper. Admit Card / Intimation Letter has 2 parts, the top portion having details of Date and Venue, Candidate Particulars and details of List of Documents to be submitted at the PMT / PET Venue must be preserved till the final conclusion of the process of Recruitment. The bottom portion of the Admit Card / Intimation letter is a Check Slip which will be taken away by the Representative Officer of the Chief Superintendent of Examination (along with Print-Out of Part-II Application and Self Attested Photocopies of the Relevant Certificates submitted by each Candidate) at the time allowing the Candidate to register for PMT / PET on the date of the Physical Examination. Candidates are advised to visit their Venue of PMT / PET one day prior to the actual Date of Examination and make sure about the Venue. No traveling expenses will be paid for the journey, if any performed, to take the Test. Candidates are advised to be punctual in reporting at the Venue at the Time and on the Date given in their Admit Card. If any Candidate fails to do so, it will be presumed that he / she is not interested in participating in further process of recruitment and his / her candidature will automatically lapse. Candidates are advised not to bring any unnecessary personal belongings to the Venue of PMT / PET as such material may become a hindrance to their effective participation in the PMT / PET. Candidates, particularly women are advised not to come for the examination wearing jewelry or carrying handbags / jholas / pouches etc. No Cloak Room / Storage Facility to safeguard any valuables or belongings of the Candidates is available at the Examination Centres. There will verification of identity of each Candidate based on the Biometric Data available with TSLPRB before permitting them to undergo the PMT / PET at all Venues. Therefore, Candidates are advised not to have mehendi, temporary tattoos or any obstructive material-covers on their fingers which mayhamper the verification of Biometrics. All those parameters that have a bearing on the evaluation / qualification of each individual Candidate, till the conclusion of the Physical Measurement Test / Physical Efficiency Test, have already been taken care of by TSLPRB. Also, Candidates are likely to be given a chance to modify / correct the erroneous entries / uploads, if any, made by them – at an appropriate time by ‘Edit Option’ or otherwise. Therefore, Candidates are advised to not worry about these errors / mistakes as long as they do not have anything to do with their evaluation in the PMT / PET.